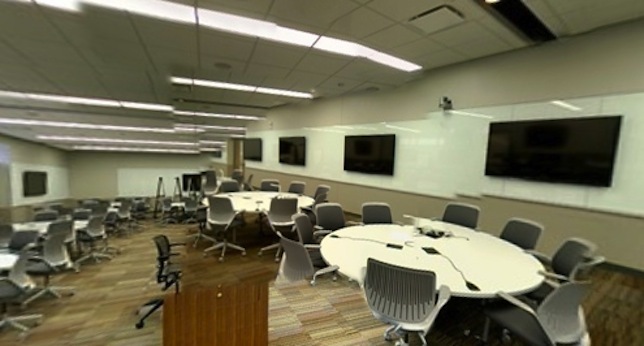 The School of Engineering at the University of Kansas has introduced several new active learning classrooms this fall, the largest of which can accommodate up to 160 students. The university has added six such spaces altogether in the school, allowing students to collaborate and share digital resources. Besides the largest space, there are rooms that fit 120 students, 90 students and three rooms that can handle up to 60 students each. The classrooms were introduced as part of a $65 million expansion the school is undergoing, which included renovations to a campus library and the opening of new facilities that connect several buildings with a new "front door." In parallel, faculty has been introducing flipped learning in their courses, an approach that some have found to be particularly effective for retaining new engineering students. The new learning spaces include round, wired tables that let participants project their projects to computers in their groups or to classroom displays. The tables also include miniature Elmo document cameras. Monitors are on the walls for the largest room, one for each table; they're at one side of the tables in the smaller spaces. Lecterns sport Wacom tablets to allow the instructor to draw on the screens and pull up and share specific displays across the room. As a blog article by Doug Ward, associate director of the Center for Teaching Excellence and an associate professor of journalism, explained, "The creation of these rooms is a huge step forward in active learning." He added that six other classrooms in two other buildings will also open this fall. "They won’t be as fancy as these rooms, but they reflect the reality that learning is changing and that learning spaces need to change, too."